Waking up cold in the middle of the night during the winter can be frustrating and inconvenient. 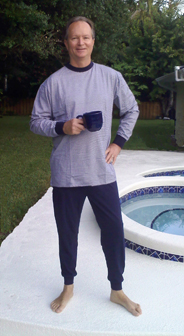 Munsingwear pajamas are designed to keep men warm and comfortable throughout the night. During the morning hours, these pajamas look fashionable enough to wear while reading the morning paper and enjoying a cup of coffee. These ski pajamas are extremely high quality. Made of 100 percent cotton knit, they allow the skin to breathe and move for the utmost comfort. The fabric is extremely durable and will ensure that the wearer is able to enjoy these pajamas for some time to come. The pajama bottoms have a buttoned fly and a comfortable elastic waistband. This helps to ensure that the pajamas fit snug enough so that they don't fall off but still allows the wearer to be able to move around comfortably. The bottoms are available in solid colors and have banded cuffs that will keep body warmth in and cold air out. The top of the pajamas are also extremely comfortable. The crew neck feels soft against the skin. The open bottom of the pajama top is designed to be either worn tucked into the pajama pants or left out, depending on the desire of the man wearing it. The top is available in a corresponding striped pattern with cuffed arms, which are designed to keep the wearer warm and comfortable. The pajamas should be ordered according to chest size to ensure that the fit is perfect. Munsingwear pajamas are able to be machine washed and dried. Some shrinkage may occur during the first washing and drying cycle. Known for their high quality, these ski-style pajamas will be a sure hit with men who like to look great while lounging in the early morning hours, while still feeling warm and comfortable at night. Wittmann Textiles Company is an industry leader with 60 years of experience in bringing comfortable cotton sleepwear directly to the consumer at the best possible price. Wittmann Textiles Company, headquartered in Hobe Sound, FL, offers the highest quality sleepwear and advertises in Smithsonian, Elks, Sierra, National Review, and others. Wittmann Textiles Company offers great personal customer service and all products are backed by a 100% Satisfaction, Money-Back Guarantee. For more information, please visit http: http://www.wittmanntextiles.com. What Is Beach Cover Up Wear For Men? Wittmann Textiles Company 60 years and counting! Copyright 2015 Wittmann Textiles Company. All rights reserved.